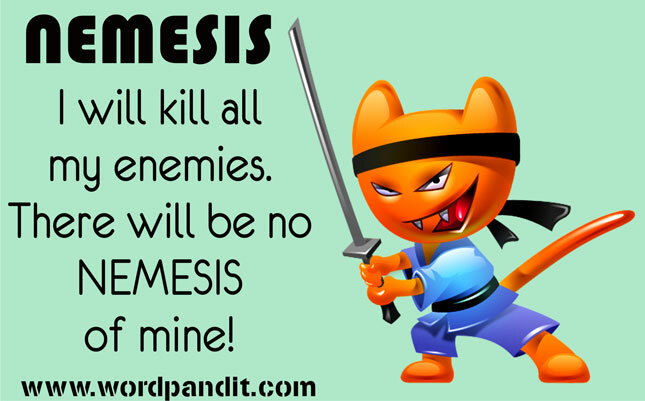 In Greek, ‘nemesis’ means ‘to give what is due’. In Greek Mythology, Nemesis was the spirit and Goddess of divine retribution against those who succumb to arrogance before the Gods. Quoting from Wikipedia: The word Nemesis originally meant the distributor of fortune, neither good nor bad, simply in due proportion to each according to what was deserved; then, nemesis came to suggest the resentment caused by any disturbance of this right proportion, the sense of justice which could not allow it to pass unpunished. In the Greek tragedies Nemesis appears chiefly as the avenger of crime and the punisher of hubris. Just image the picture of worst enemy who always defeats you (person or thing): He is your Nemesis. As we see from above, the word in the given context means ‘one’s enemy’.